The installation represents the image of an entity escaping from a substance, which symbolizes freedom, such as flying whale. The installation represents the image of an entity escaping from a substance, like flying whale that symbolizes freedom. 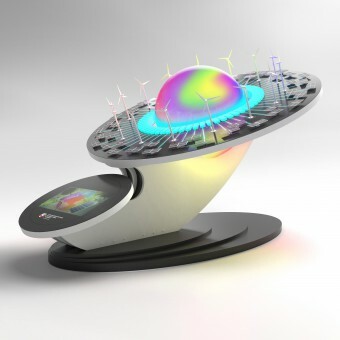 The heart of the entity is the planet image (the tilt axis of the installation is equal to the Earth's axial tilt), made in the form of glowing iridescent pulsating sphere that symbolizes the unity of people in feelings and life. Technologies that sustain life of this entity (solar panels, wind generators and batteries) are placed around it's heart as planet orbit. Traditional sources of energy are irresponsible to nature and human connection with it. Art installation reveals the potential of harmonious and free co-existence of man and nature possible due to renewable energy carefully related to the environment. Saving the diversity and purity of nature, which gives inspiration to freedom, we maintain our ability to feel. And the ability to experience feelings is something that unites all people on our planet, which is reflected in the installation image. Switching on / off the installation is operated by the button located under the small disk. The scenario of highlighting and speed of wind generators fan rotation are realized automatically according to the prescribed scenario. 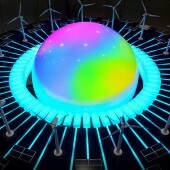 When wind generators work slowly and power generation is slow the sphere shines dimly, when wind generators work quickly and power generation goes faster, then the sphere begins to pulsate intensively, thus symbolizing life. The display is operated in standalone mode. The project started in June and finished in December 2017 in Moscow, and was exhibited in RIA News and Ecotech in December 2017 in Moscow. The installation structure is made of MDF. The sphere is made of acrylic milk glass by the vacuum forming technology and is divided into two parts for more convenient installation of internal LED structure. There are LED strips under the large disk that show the indication of the power transmission from the miniature of solar panels and wind generators to batteries. The highlighting has a programmed work script. 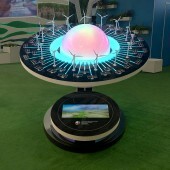 There is a display showing the presented technologies on the small disk. Dimensions, mm: 2000 x 2600 x 1480 (without miniature, 1700 with) Unit weight: 295 kg. The bulk is concentrated in the base and the mass is 170 kg that gives stability. 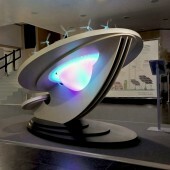 Consumed electric energy: 220 V, 600 W. Art installation consists of 5 main parts (base, large and small disks, carrying rib and sphere), which facilitates the transportation of the structure and its assembling at exhibitions. Installation packaging is a soft fabric that protects against bumps and scratches. Design research and development of installation was carried out according to the author's method based on studying of human psychology and on the semiotic of constructing meanings in the form of a design product. Semiotic method helped to create a single story in the art installation. All colors, shapes and textures, interacting with each other in the context of the image, and also interacting with real or abstract images that exists in the viewer mind, help to recreate the original idea. The main project image was concentration not on satisfying physiological electricity needs or security needs (the most common stereotype about renewable energy), but on actualizing spiritual needs that are at the top of Maslow's pyramid of needs. In the production process, there were difficulties with electronics implementation. Due to the large number of LEDs (38 meters of LED stripes), electrostatic noises were generated. The problem was solved by using ferrite rings on key electronic nodes. 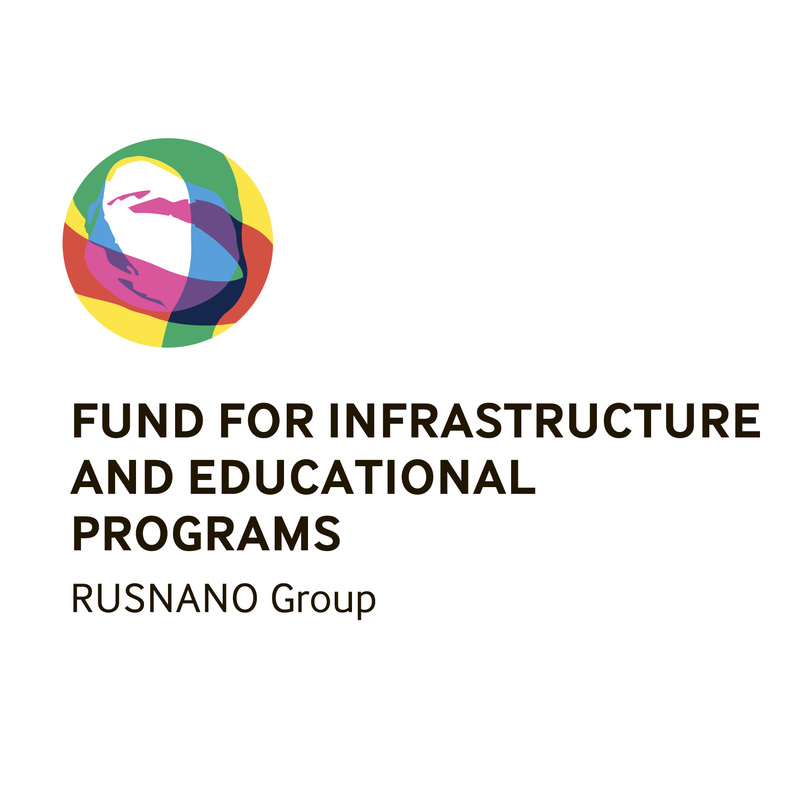 The activity of the Foundation is aimed at supporting and developing all Russian nanoindustry enterprises, including those that are not RUSNANO project companies. The Fund is engaged in educational activities in the field of modern technologies and nanoindustry developing communication links in business. Greenenj Art Installation by Dmitry Pogorelov is a Nominee in Arts, Crafts and Ready-Made Design Category. Greenenj Art Installation by Dmitry Pogorelov is Winner in Arts, Crafts and Ready-Made Design Category, 2017 - 2018. Did you like Dmitry Pogorelov's Art Design? Did you like Greenenj Art Installation? Help us create a global awareness for good art design worldwide. Show your support for Dmitry Pogorelov, the creator of great art design by gifting them a nomination ticket so that we could promote more of their great art designs.